Home › Get Your FREE Shadow of War Game Bundle, for a Limited Time! Forge a new Ring of power and dominate Mordor with the GeForce GTX 10 Series. Experience Middle-Earth: Shadow of War like never before and photograph epic moments with NVIDIA's Ansel. These incredible graphics cards, systems, and notebooks give you a whole new level of performance for 4K, HDR, and immersive experiences like NVIDIA Ansel™. It’s all powered by NVIDIA Pascal™—the most advanced gaming GPU architecture ever created. 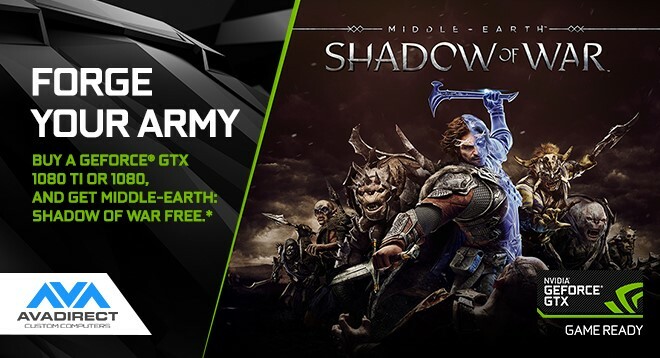 Take home Middle-earth: Shadow of War when you get Game Ready with a GeForce® GTX 1080 Ti or 1080 graphics card, system, or notebook.